We are really struggling with potty training our three-year-old daughter. After using the potty for a while, she has now pretty much decided not to use the toilet. She will have an accident and then say next time she will use the potty, but then does not. I have tried some different angles to convince her using the potty is a good idea since unfortunately, she is not too concerned with poopy underwear or wet pants. When she has accidents, I let her know I am disappointed, ask why she didn't use the potty when she was on just minutes before her accident, or remind her that her friends all use the potty. Is there something I am missing? Should we go back to diapers for now? She does still wear a diaper to bed. Any words of wisdom greatly appreciated! I feel your pain. The transition to using the potty can be a challenging time for parents. We want to encourage and motivate them, but ultimately this is completely their task and we have little control over whether or not they use the potty. Yet, we often feel pressure from preschools, extended family members, and all those parenting books to get our children using the potty by a certain age. Add in a toddler or preschooler in the midst of developing their sense of independence, and we have the perfect set up for major power struggles. Regardless of how we approach it, we will get through it quicker with that calm, nonjudgmental mindset. We really want to convey that it is her body, and her choice. When she is ready to use the potty, she can. You can let her know that you know she can do it and will when she is ready, but ultimately its up to her. Generally, until they really believe this is our attitude, they often use it as a power struggle to find a way to maintain their dignity. 1) Go back to pull ups temporarily. You could say that you know she is not interested in using the potty right now, so you are going to go back to pull ups. She can let you know when she is ready to use the potty regularly, and then she can switch back to undies. It has to come across as not a punishment, just that if we don't want to use the potty, we need to wear pull-ups so that it is easier to clean up. 2) Let her stay in undies and just accept that she is going to have accidents regularly. We can help motivate her by helping her be involved in clean up (when its pee, not poop of course!). She needs to take off her wet clothes, put them where the laundry goes, and put on new undies and clothes. If this is not something she usually does, you want to be sure to take some time for training. This means walking her through it a few times so she knows exactly what to do before asking her to do it by herself. Again, it is so important not to share any judgment or anger. Just “Oops, looks like you had an accident, what do you need to do to get cleaned up?” Not making a big deal about it will actually get her through this stage quicker. 3) Regular potty times. Sit down with her and say that you have noticed she has had more accidents lately. You can let her know that it's ok to have accidents, but the clean up takes time away from getting to do fun things. To help you guys not get delayed by accidents, you are going to have regular potty times during the day, and would like her help figuring out when those times should be. You might say that you always have to go to the bathroom when you wake up, so how about we have that on our list. Then ask her what other times might be good to have potty breaks. Make a list together of all the potty times. Some good times to suggest if she doesn’t mention them are wakeup, before leaving the house, before meals and snacks (since we often wash our hands then any way), and bedtime. Next comes some planning together about how you will remember when to go to the bathroom. Ask her how she would like to know it’s a potty time. Should you make a chart with pictures? Set alarms on your phone? The point of this is to get her involved as much as possible. When those potty times arrive, we need to follow through. You might say, "Oh, the potty timer is going off, what do we need to do now?" If she doesn't want to go, you can use a "when...then..." statement such as, “When you go to the bathroom, then we can go to the park." Then you need to keep yourself busy to avoid reminding, nudging, coaxing, threatening, etc. I know this can be very challenging, but the more we avoid those constant reminders, the less power struggles we create, and the quicker the process goes. 4) Don't ask her to go to the bathroom. Asking invites a yes or no. With our independent little preschoolers, usually it’s a loud and proud “NO.” Try using when…then… statements whenever possible. When you have gone to the bathroom, then we can finish our game. Even just saying, its time to use the bathroom is likely to be more successful than, "will you please go to the bathroom?" You can mix and match any of these. The important part is the lack of judgment, punishment, shame, and praise. When she does use the bathroom, you could say, "Thank you for taking care of your body." Or, "I noticed you went pee pee on the potty!" And, you may want to start with just taking a week or two break, either using pull ups or not making any big deal about accidents just to get it out of the power struggle stage. Sometimes both parents and children have been so worked up about challenges, that a break allows us to calm down and connect with each other. Once this happens, the methods mentioned above may help quicker. Bottom line, I promise she will be using the potty before college. My daughter dragged her feet on this one too. Until I was ready to accept this was completely her task, she was not going to lose dignity by going potty on demand. This makes sense though, as many of us resist when we feel forced to do something. Can you imagine someone demanding you use the potty when they say so? Remember, they have no shame about going in their pants at this age unless we have shamed them about it. 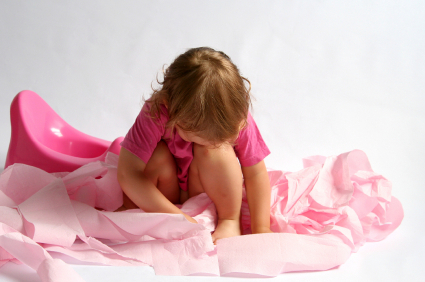 While an adult is motivated to avoid the stigma and discomfort associated with accidents, we have had our little ones going to the bathroom in diapers since birth. Once my daughter started preschool the fall after turning three, she basically potty trained overnight. The routine of going potty at the same time every day with her classmates, and the lack of me being involved seemed to be the key. It was a great opportunity to learn again that my daughter is her own person, with the ability and desire learn and grow when I give her the space to do so. I am grateful she reminds me of this often.